Some Quick Notes taken during my 'OZ Holiday 'Wayback in 'Twenty-Eleven, albeit very sketchy & incomplete now while trying to cleverly craft a story outta them some four Bloody years later, Mates! Thus, the OZ Grand Prix is already becoming another fleeting memory, albeit a very good one, as I still cannot believe it all went so damn smoothly ‘Down Under! Of course this was helped immensely by my cadre of travel experts: Krista, my AWESOME Hostess (with the MOSTEST...) Paul, our logistics officer; Jake – my most Excellante Sighted Guide, Patrick, our lyrical entertainer, and last, but not least, Deb & Steve’s Crew, our wonderful Melbourne Host committee. So I was unawares of the term ‘RevHead – which is used quite commonly to describe us motorsports freaks, until arriving Down Under, where I learned other good slang like Cactus; Hya! And thus it was a Boyz day out, as Paul, Jake, Patrick and I made the quick trip to Downtown Adelaide for the day’s running of the V8 Supercars, along with the support classes, i.e. ; Ute’s & various 'OZ racing cars. Funny, how I don't remember any of this NO more 'cept for the afternoon's sprint race, which to Mwah seemed to be vintage racers, or as Artiste Dave says: "Old Men in Old Cars!" Remembering casually mentioning to Krista, who took cursory notes for Mwah, (below) not only could I S-E-E the cars, I could feel 'em too! And I'm pleasantly surprised, that like the Support Race Wrap web link the following article from the local Adelaide newspaper I'd found four years ago is also still active. Patrick & his Army tanks = Armored Personnel carriers; 2-onhand. Otay, it's all very foggy now, but I do somewhat recall the day's outing, which thankfully we went on the sunny, dry day vs. Sunday morning's deluge! Recall sitting on the grass during the morning or was I-T afternoon slog? Although remember watching the V8 Supercars blitz by on the cordoned-off four-lane street, which was a blur with A-L-L the various white lane striping. And know we walked around the Paddock, since remember thinking how the Commodore Utes' reminded me of some ugly modern day bulbous El Camino's. And perhaps we did look at some Formula Fords? Since I think I remember looking at some tiny single seater racing cars? Then we moved to the opposite side of track, as just Jake & I went off to watch the V8 Supercars 'Qualie Top-10 Shootout from afar, as it was really fun watching the individual Commodore's and Falcon's blasting along the straightaway into the corner, which reminded Mwah of Formula 1 Knock-out qualifying, since the times kept getting quicker 'N quicker before DRAT! 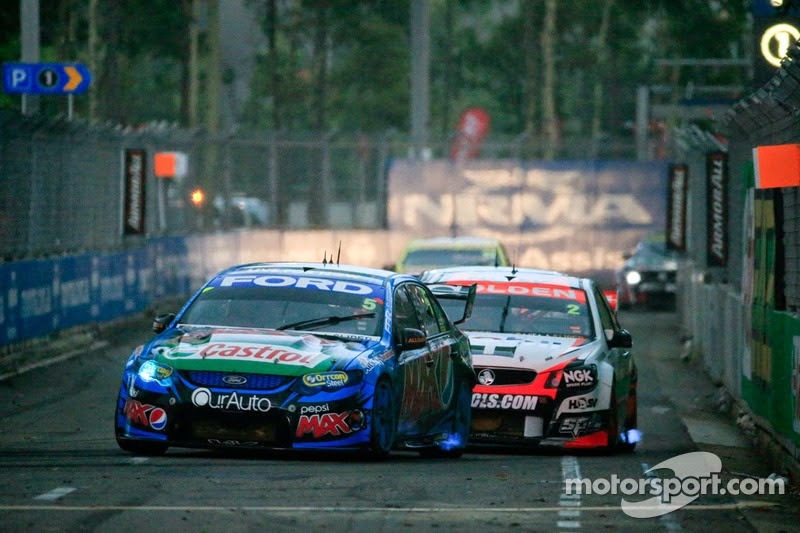 Garth Tander in a 'Chebbie; Err Holden Commodore took Pole. Yeah, we actually sat on that "Grassy Knoll" in the afternoon for the day's race, since I remember now how we kept wonderingg if they'd ever finish the race after multiple late race wrecks! Before we left for the day, Mates!